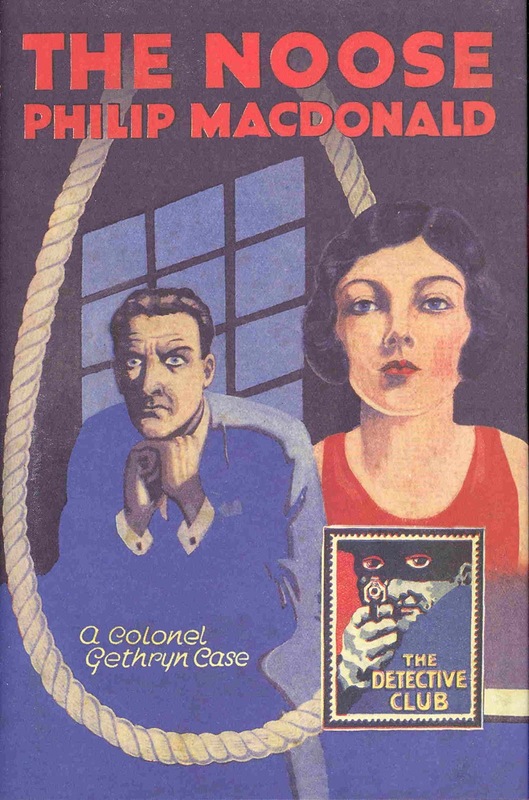 The Detective Story Club was launched in 1929, with the expressed purpose of publishing the best detective and mystery novels as selected by a committee of experts. 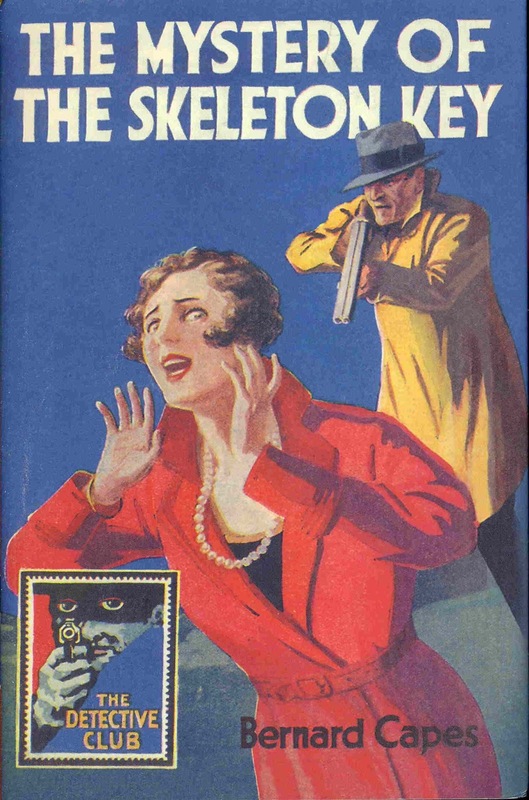 Each volume was marked with a distinctive "Man with a Gun" stamp on the cover. 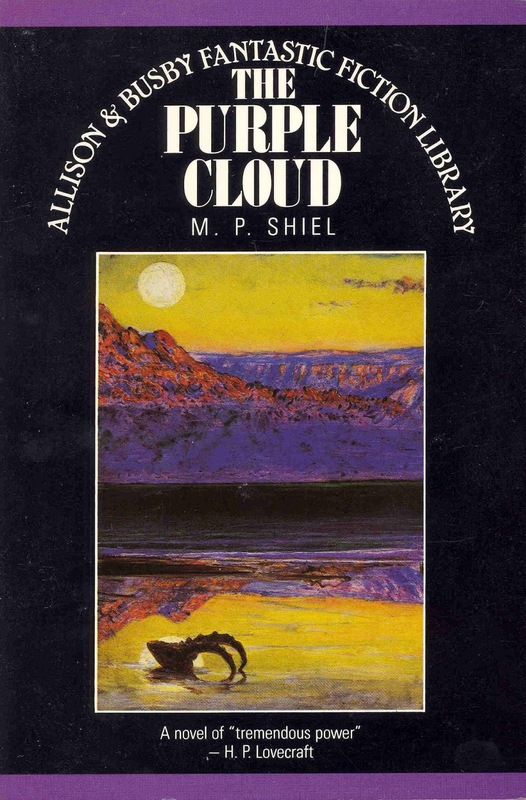 In 2015, HarperCollins began reprinting the series, with new introductions. Some of the books lean over towards the supernatural genre, even if they don't embrace it. Some of the new introductions are by noted genre authorities like Richard Dalby and Hugh Lamb. Some of the novels are by authors well-known to genre readers, like Robert Louis Stevenson and Bernard Capes. Here I'd like to call attention to four of the titles published so far that might be of interest to readers of Wormwoodiana. Dr. Jekyll and Mr. Hyde, by Robert Louis Stevenson, contains more than just the classic story. 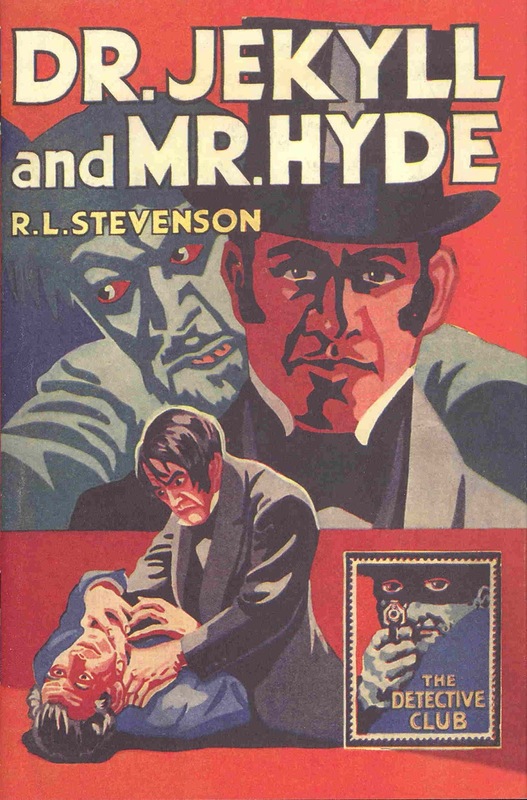 Introduced by Richard Dalby, there are two additional stories by Stevenson ("The Body Snatcher" and "Markheim") and two additional stories by other hands (the anonymous 1890 "Untold Sequel of the Strange Case of Dr. Jekyll and Mr. Hyde", later attributed to one Francis H. Little, and a pastiche "Dr. Jekyl" [sic] by Robert J. McLaughlin). The whole series is well worth looking into. 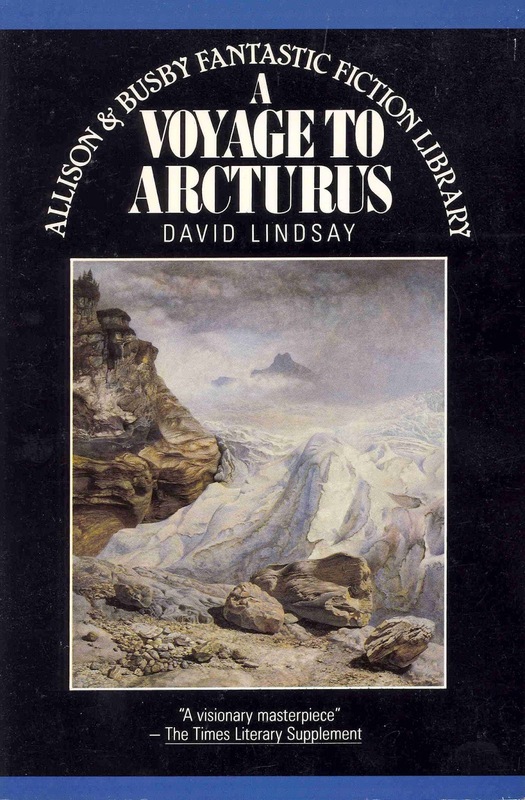 A Voyage to Arcturus, by David Lindsay, with cover art "The Glacier of Rosenlaui" by John Brett. 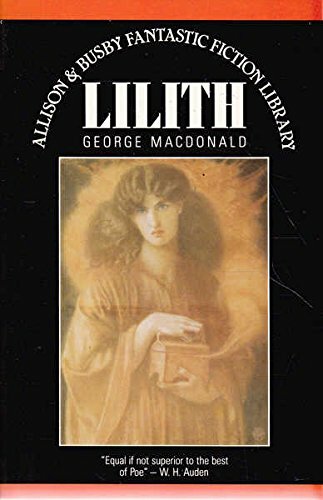 Sadly the text of the novel, though re-set, follows that of the corrupt 1963 Macmillan edition, which was line-edited by the publisher, resulting in literally thousands of changes—some merely punctuational but a large number are word changes and rephrasings that alter Lindsay's text. And with these initial releases, the series died. Alas. Allison & Busby had been founded in 1967 by Clive Allison and Margaret Busby. In 1987 the firm was acquired by W.H. Allen, Ltd. According to Margaret Busby this represented "finally succumbing to the exigencies of being penniless." Whether the fantasy series died before or after the acquisition is not known. 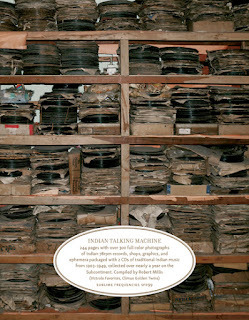 Robert Millis describes his book Indian Talking Machine as "photographs and notes" about ""78 rpm record and gramophone collecting on the sub-continent". It's a chronicle, mostly visual, of a journey in search of the relics of early Indian records, and comes complete with two CDs of the music he discovered. The photographs are fascinating and beautiful, capturing texture and colour and detail with a sympathetic gaze. They depict the records in all sorts of conditions, from those with still vivid labels and sleeves to those that have become simply circles of dust, corrosion or decay. He captures images of the records still stacked in the forgotten corners of curio shops and the few remaining vintage record emporia. In his text, Millis provides a brief history of how the recording industry came to India,and the companies, shops and often long-lost artists involved. Most interesting of all, though, are his brief accounts of meetings with obsessive collectors, who make even the most ardent bibliophiles seem amateurs. These gentle, courteous,enthusiasts share their delight with him. "I hope you do not frighten easily," says the veteran collector VAK Ranga Rao as he welcomes Millis to his home in Chennai, a sanctuary for some 45,000 78rpm discs. It includes, Millis notes, "an entire room of records which are unsorted and will likely remain that way". Elegiac in tone, the book is also a celebration of these learned collectors, who are "archives of knowledge and experience," and "a living way of experiencing and organising" a small, selected, personal part of the world, "chaotically human". A short story set in a secondhand bookshop by Reginald Walter Coulter, a New Zealand-born, Sydney-based cartoonist, illustrator and author, from Australia's premier literary magazine, The Bulletin. I had never before seen this bookshop. It stood in one of that maze of little streets about the Haymarket, that part of Old Sydney which seems to have been subdivided by a small boy with a playing card and a pair of shears. The shop was extremely old-fashioned, with a narrow front pierced by a small six-panel window and a low door over which a small conservative sign said ‘Pedersen – Second-hand Books.” The usual emblematic shelf and box of “Thruppennies” stood under the dirty window, and the shop door was two steps down from the doorsill. It was too inviting. I went in. Inside was dark and musty, and no one was there. It was dead. No one came to ask my “requirements.” I thought of The Magic Shop, that this had had been specially created to-day for my benefit and would disappear by tomorrow. Every eight feet or so shelves jutted out at right angles to those lining the walls, forming little alcoves. They disappeared away in darkness, the shop was so deep. In each alcove was a table, and on each table stood a disturbing anachronism: an electric reading lamp flanked by a notice, “Please switch off when finished using.” In such a place one looked for verdigrised brass candle-sticks and yellow candles. Some yards down the shop I switched on a lamp and looked over the shelves. They were a mixed bag. Ben Jonson rubbed cheeks with Swedenborg and Sidonius Apollinarius with Thomas àKempis, whilst uncut Brontes and Eliots jutted out everywhere. I pulled out a book I had heard of but never seen. It was Holberg’s Subterranean Voyage of Nicholas Klimm, and I sat down to browse. “Ah, sir, you are fond of the classics?” a thin, piping voice gently broke through the phantasm. It was a little white-haired man, standing gnome-like and smiling behind the lamp. He was perfect. The second-hand bookseller one reads about but never meets. Here was a bookseller who loved books for their own sake. I had read of them, but – unreal, unreal! I waited for him and the shop to vanish and find myself in Paddy’s Market. “Even then I don’t like selling them,” he added. Was he pulling my leg? It sounded too much like the books. But his enthusiasm and his innocent baby-old face impressed me. I let him take it up. It was a thick, leather-bound quarto volume. “The Subterranean Voyage of Nicholas Klimm,” he murmured to himself, stroking the worn leather. He looked steadily at me and appeared to make up his mind. “This book’s haunted,” he said. He darted out of the alcove and down the shop. I followed, and found him halfway up a library ladder, expectantly waiting for me like an excited puppy on for a game. High up in the wall was a small, dirty window, one of the up-and-down counterweight type. The old bookseller went to the top of the ladder, opened the bottom of the window, put the hook on what appeared to be a long ledge outside, shut down the window with a bang, and dashed down again to my side. “Listen,” he said, holding up a silencing finger. For a moment nothing happened. Then the two frames of the window hit together with two sharp double knocks, like hiccups. Another moment and they started to tremble together as though shaken by a wind. But there was no wind. An auctioneer’s flag in the bright light of the street across the rode hung stiffly inert. By comparison, the musty catacomb of books, with its ghostly percussions, was weird and uncanny. The little man gave a nervous chuckle. “Listen, he’s trying to get in!” I listened. The rattling became erratic. Heavy and soft concussions succeeded each other irregularly. There was something familiar about the variations. What was it? My brain chased the rats and mice around and around the cage of my memory till I thought my skull would split. Suddenly I sensed something behind me, and, with animal fear, wheeled. A dark and sullen-looking young man was padding slowly down the shop, eyeing us sidelong like a suspicious but watchful dog. Electrical! That was the clue. The rattling was Morse. I listened. We stared at each other, now marvelling. The little bookseller’s facial expression changed to pathetic compassion. He put his head on one side and said, “Now isn’t that sad!” Let’s let him come in.” I nodded sympathetically. He ran up the ladder, and as he opened the window the timorous chattering ceased. The old book seemed to cuddle into the old man’s breast as he descended. “Poor old Holberg,” he stroked it soothingly. “We’ll put you back in your bedroom.” We returned to the lighted alcove and he laid the book on the table. I sat under the light feeling rather bewildered and looking up at the thin, eager face swimming between the murk of old bindings and the lamp. The gnome hugged his logic. But I was incapable of thinking. Now I had a window which was loose. It would be rather intriguing to puzzle the fellows – that gross materialist Smith, for instance. “How much do you want for it?” I asked. I looked the book over. It wasn’t so very old – 1830 – but well bound and in good condition, and I had never seen another copy. Also there was that supernatural business. A haunted book! I pulled out ten schillings. “Certainly, sir, I’ll get you a receipt,” he pattered pleasedly off. It was almost dark as I came back along that little street. At the far end a big illuminated sign was saying in words appearing separately, one after another, “Funnell’s for Funerals,” in constant repetition. “Clever how they do that,” I said to myself – “sort of player-piano cylinder – certain groups of holes make certain words.” I started to laugh; by Odin and Thor, a thought had struck me. “Here’s the two quid.” I handed over notes to the little innocent old bookseller. “I’m sure you’ll appreciate him,” he said as he wrapped the book. How did he know? His quote was quite pat. I am told that that gross materialist Smith has a haunted Petronius for which he paid ten guineas. I can’t say for certain, because he and I don’t speak now. Recently published is the new issue, no. 27, of Le Visage Vert. Highlights include two stories by Thomas Burke translated from English into French ("The Hollow Man" from Collier's, 14 October 1933; and "The Hands of Mrs. Ottermole" from The Story-Teller, February 1929; both collected in The Best Short Stories of Thomas Burke, edited by John Gawsworth in 1950, and The Golden Gong and Other Night-Pieces and Unpleasantries, edited by Jessica Amanda Salmonson in 2001). 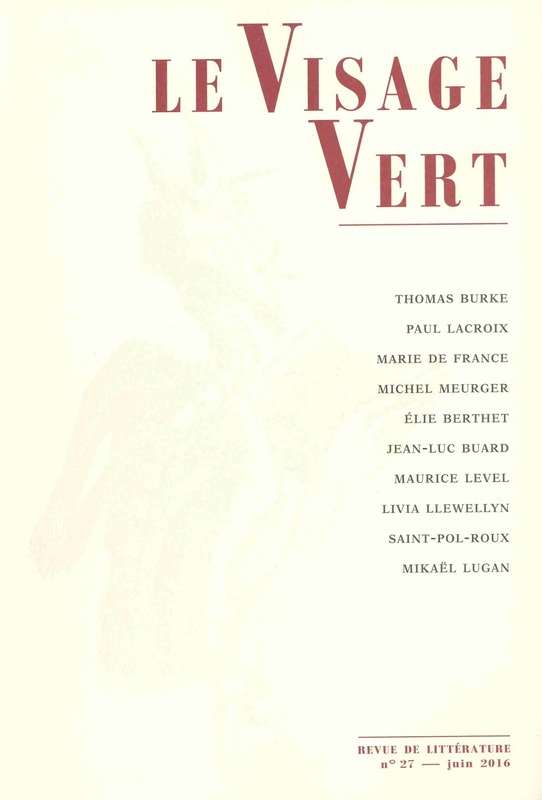 A third installment of Michel Meurger's historical study of werewolves is accompanied by three examples, including Marie de France's "Bisclavret", an extract from Élie Berthet's "Le Bête du Gévaudan" and Paul Lacroix's "Le Loup-Garou" (1834)--which proves remarkably to have been the original source of Sutherland Menzies's "Hugues, the Wer-Wolf: A Kentish Legend of the Middle Ages" (1838), with the setting altered to Kent. French grand-guignol writer Maurice Level is represented with four short tales, and an article about him by Jean-Luc Buard. 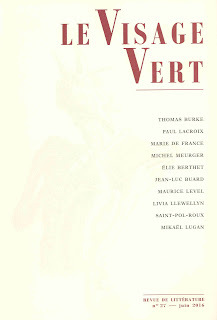 There is also one story by the French symbolist poet Saint-Pol-Roux, as well as an article about him by Mikaël Lugan. And contemporary American writer Livia Llewellyn is represented with a French translation of her story "Furnace" from The Grimscribe's Puppets (2013), edited by Joseph S. Pulver Sr. The volumes closes with the usual (and very informative) section of Bio-Bibliographies. Ordering details can be found here (scroll down). An anonymous ghost story published in an Australian newspaper at Christmas 1848. PENROYSTETH CASTLE. A LEGEND OF TERROR. AN ORIGINAL TALE. I was born in 1811, on the eve of the battle of Waterloo, although nowhere near the scene of that memorable contest. Ajmeer, the most central station of India, having over looked, with its thrice sanctified minarets and pagodas, the roof beneath which I was ushered into the world. My father, Colonel Berkely Wagstaffe, then in command of a dragoon regiment, dying shortly afterwards of a malignant fever, I was taken by my surviving parent, the Lady Alicia, to England, where I was received by Sir Greville Wagstaffe as the heir presumptive to the immense estates of Penroysteth Castle and Domain, lying in the county of Cornwall, and of the ancient baronetcy attached to those possessions. My mother, who, as Lady Alicia Gisborne, daughter of the Viscount Hanbury, had allied herself at the age of sixteen to my father at the age of forty, although still young and beautiful, preserving her widowed state, gave herself up entirely to the care of my nurture and education, in the fond hope that an extinct peerage in the Wagstaffe family might be revived in my favor, through the joint means of influence and wealth, and the strawberry leaved coronet of my ancestors might again encircle the brow of her only and darling son. I received my early education at the attractive College of Harrow, passing the vacations at a pretty country seat bequeathed to my mother for her life, by her departed husband, but on reaching my sixteenth year, I was removed to the splendid mansion of my grandfather, where Lady Alicia had been invited to take up her abode, and my subsequent training in arts and arms confided to a Dr Emanuel, a gentleman of Hebrew descent, but of the Christian profession; and thus sur rounded with every means of luxury and happiness, I passed the time until the period appointed for entering on the usual circle of continental travel. Previous to this, however, occurred the solemn and strange events which it is my immediate purpose to leave upon record. I said that I had every means of happiness within any reach, but nevertheless, unalloyed enjoyment of early life, as in many other cases, was not destined to be mine, and the thorn brier in my path was a domestic in the employment of Sir Greville, a man who acted ostensibly as his valet, but really as major domo of the establishment. Unquestionable as were the position and prospects of Lady Alicia and myself in the Castle to which I was the heir, yet so complete was the mastery that this cold, caustic, impenetrable man had gained over my grandfather, that nothing could take place without his being consulted and his acquiesence obtained. Lady Alicia could not get the family coach for an airing, nor I my saddle horse, dogs, gun or fishing rod, for an hour's amusement, without his nasty temper was in some way propitiated; every servant but one was at his nod or beck; to him they owed their situations, and upon his favour alone they retained them, he had surrounded his master with his own dependents, and contrived in every, the most trivial matter, to have his own way and advance his own interests. His jealousy at the introduction of myself, Lady Alicia, and Dr Emanuel into the house, where no mistress had been seen for twenty years, and no one had hitherto divided the sway with himself, knew no bounds, and every system of annoyance short of absolute rudeness, was practised towards us all, but particularly to myself. Naturally of a high spirited and independent character, I determined to wage ceaseless war with this bugbear of my existence; vowing in the heat of my indignation, that either he or I should be wanting at the castle, before twelve months had passed over our heads; nor was I without allies against Stafford (such was his name,) for Brierly, the butler and his son Jack, an under game keeper, were his sworn enemies, and owed the retention of their places to the forty years' servitude of the former, in the responsible situation which he held in the household. By their means, I resolved to obtain my end, and the narrative of the events which followed my determination, will show the nature and extent of my success. Mr Stafford being of Scotch extraction, pretended amongst other amiable qualities, to an extra degree of presbyterian sanctimoniousness, and failing to find a preacher after his own heart, in the national church, succeeded in introducing on the estate, an Independent dissenter, who was not only allowed to establish himself, amongst the mining laborers of the domain, but received an annual stipend from the liberal purse of Sir Greville. To this place of worship, the Major Domo used regularly to march on every Sabbath morning, followed and surrounded by the whole sept of those Caledonian menials, whose services he had dexterously substituted, in the place of the simpler but less flexible domestics of Cornish breeding. At chapel, he acted himself as precentor, and occasionally exercised the gifts, as he termed them, of prayer and exhortation; never failing, however, to exact the most rigid deference to his person, as well from the humble miners, who attended, as from his own domestic companions; while at home, he displayed an exclusiveness of disposition, and established an espionage that was perfectly intolerable, ever to the most servile of his creatures. A few months after my arrival at Penroysteth, one of the poorer servants obtained the privilege, of having his daughter placed upon the serving staff at the castle, through the influence of Stafford, under whose patronage it was announced the family had been taken, with a view to bettering their condition and pushing their fortunes in life. Lucy Deacon, when introduced to her new sphere of occupation, was about fifteen, a pretty demure looking creature, whose exemplary attendance at the meeting house and Sunday school, had gained her, I presumed, the favorable notice of her patron. She was placed by his instructions under the especial care of Mrs Heath, the housekeeper, and it was intimated, that on no account were my casual visits to that quarter of the house to be encouraged. It may easily be imagined that this gratuitous piece of impertinence, was the most effectual way to put a youth like myself upon conduct the very opposite to that which was to be so carefully guarded against. I made it in short, a point, to find needless excuses for visiting Mrs Heath's sanctum, and seducing her ward into a flirtation, but finding, after repeated trials, that the little maiden, both when under the eye of the housekeeper, and when alone with myself, was not only invariably staid and respectful, but seemed to be distressed by my foolish attentions, I had the grace to abandon this line of attack and fall back upon other resources of aggression. Things were in this position, when my seventeenth birthday arrived, and by the permission of Sir Greville, I united a number of my old schoolmates at Harrow, to join in the festivities of the week, set apart to commemorate this important event. The first two or three days after our set had mustered, were devoted to those pursuits which boys particularly covet. Under the charge of careful gamekeepers, we sallied out one day, to whip the neighboring stream for trout; the second, we ransacked the preserves for pheasants and woodcocks; a third, we rode about the grounds, and held cricket or archery matches; and on the fourth, we drew the warrens and covers, and coursed with the best greyhounds of Penroysteth and the neighborhood. On the fifth, we joined the elder guests at a magnificent picnic, and in the evening took our parts in the gaieties of a ball; this, indeed, was the gala day, being that of my nativity, and the following day being the last of the week, the company broke up, and took their departure for their several homes. Three or four of the senior class, amongst my own companions, were detained at my request over the following Sunday, but we passed the Saturday morning in sauntering over the house and grounds, in a manner that evidenced the ennui which the contrast of extreme quietude to extreme excitement naturally occasions in the overstrained and undisciplined mind. In a sheer fit of idleness, we lounged down into the basement story of the building, and carried our restless search over every room of the servants' department, from the store-room and scullery to use servants’ hall and butler’s pantry and housekeeper's room. In the last, we found Lucy engaged in arranging the furniture, and led by myself we began, with all the precocious faculties of boy-men, to make love to Mr Stafford's protegée. Judge of my surprise, when, instead of witnessing the distress, or at least customary reserve which I had expected on her part, I found her prepared at all points, and able by repartee, look and action, to play the part of a finished coquette. Observing her more particularly, I saw that her personal appearance had been highly improved in dress, carriage, and manner; she was actually metamorphosed into a fine young woman, with a pair of bold, black, sparkling eyes, and a red full-lipped month, which although rather large, displayed, when she laughed, a set of teeth that glistened like enameled ivory; her hands were not quite so perfect as a tenderly-bred lady's, but the skin of her face was clear, although dark, and suffused with a damson colored bloom that a duchess might have envied. Out of the pleasant understanding, however, which we had established, with the beauty of Mrs Heath's sanctum, we were suddenly roused and put to flight, by the entrance of the pragmatical guardian of the young lady, the glossy stare of whose eye, and whose lengthened physiognomy effectually neutralize all our fun, and sent us off in search of old Brierly, upon whom we had agreed to call, to assist in making fireworks for that evening's contemplated display. We found the butler busy, under Sir Greville's instructions, superintending the cleaning out of a suite of apartments, which had never before been entered by myself, nor to my knowledge by any inmate of the place. Catching at any trifle, wherewith to amuse ourselves, we commenced gambolling through these rooms, criticising the antique furniture, and making the cobwebbed walls and ceiling ring to our boisterous laughter. This natural escapade however was presently and formally checked by the appearance of the old domestic himself, who assured us of the displeasure with which my grandfather would view any unseemly exhibition of hilarity in a place sacred, as we understood him, to the memory of the dead. This announcement having eventually restrained the effervescence of our spirits within due bounds, our curiosity expended itself in a series of questions as to the meaning of Brierley's caution. Who was the dead, and what the nature of his end? It turned out to be one of those generic stories so frequently found attached to old houses and families, especially amongst an ill-educated and superstitious peasantry, of dark deeds and darker characters, whose shadows, long after their day, rested upon those stricken walls, and either consigned them to the ominous solitude of the grave, or left them in the sole possession of those rest less and unembodied spirits, who, according to tradition, still haunted the scenes of their former guilt. After the lapse of nearly a century, the wing, in which these apartments were situated, was to be re-occupied; but it was plain to see that neither, the butler nor his underlings were at all reconciled to the task imposed upon them, while, with many a mutter and many a whisper or shake of the head, the handmaidens strove to get through their allotted task before the evening shades came on. "By Jove," I cried, "here is an adventure; let us he the first to occupy the haunted rooms, the first to greet the ghosts on their restoration to animated society. What say you?" "Agreed, agreed," was echoed by my companions, on every side, and what was then propounded, half in jest, was before the night set in determined on, in serious consultation amongst ourselves. As soon, accordingly, as the household was dismissed from evening prayer, we took possession of the largest room, resolving, with the aid of Brierley, to make a night of it, and by the blaze of a cheerful fire, assisted by numerous wax can dies, and a capital supper of cold game and pastry, with some light Rhenish wines, we made ourselves and each other equally comfortable and cheerful. We sat down to the tempting comestibles amidst general jesting and laughter, and with many a toast to the health of the supposed spiritual tenants, we made the time wag pleasantly, until within half an hour of midnight, when, drawing our chairs round the fire, we endeavoured to amuse ourselves by recounting the pleasures, occupations, and exploits of the foregoing week; the conversation, however, began in a few moments to flag, and I saw that drowsiness was fast overpowering the whole party, except myself, the result, as I conjectured, of the late hour and the meal of which they had so heartily partaken. In short, the whole three were, in a marvellous short space of time, nodding in their chairs; whilst I, leaning back in my seat, saw the fire burning low on the hearth, and the candles casting their cross flickering light athwart the various objects at hand, without feeling much inclination either to stir up the one or rearrange the other. I was finally about to sink, myself, into a state of unconsciousness, when suddenly my ear was saluted by a low whirring noise, that sounded as if from some concealed closet within the room, and something like a chain wheel running abruptly down. Roused from my reclining attitude, I gazed around with an anxious eye and a palpitating heart my surprise was increased when I heard this singular sound I describe, followed by the distinct and deep, but distant boom of a clock; one-two-three-four-five-six-seven-eight-nine-ten-eleven-twelve, I heard echoed, now clearer and louder, now fainter and thicker, upon the midnight air without; and I was conjecturing what church was near enough to Penroysteth, for me to hear the note of time so distinctly, when the entrance door opened and rolled back upon its hinges to its utmost stretch, with a quick but perfectly noiseless motion, and the figure of a female, dressed in deep mourning habiliments, stood upon the threshold; a mantilla or shawl was drawn over her head, in a manner that caused its sable colour to contrast frightfully with the grave-like pallour of her features; her eyes, fixed yet gleaming, were directed into the void space of the apartment, nor did they move the slightest in their hollow sockets, as she advanced with apparent unconsciousness of our presence, wringing her attenuated hands with the deepest expression of unutterable woe! Rooted to the spot with intense dismay, I stood and looked upon the unearthly visitant as if paralyzed with the terror which parted my lips, caused my tongue to cleave to the palate, and the hair of my scalp to crawl with unmitigated terror; a minute sufficed her to cross the room and vanish through the opposite door, which rolled in the same mysterious manner upon its hinges, although touched by no visible hand; to afford her exit. As the skirt of her robe cleared the sill, both doors closed with a bang that echoed through the house, and I fell as if struck by an electric battery, to all appearance dead, upon the hearth. The combined noises which I have mentioned, startled my companions from their slumbers, when they beheld with affright my prostrate and inanimate form stretched upon the floor, nor was their alarm decreased when on stooping to raise me in their arms, they observed my white shirt front and collar bathed in blood. To this circumstance, perhaps, I owe my life, for the congestion of the brain under which I was laboring, was relieved by a copious discharge of the sanguine stream, which in a few moments was discovered to be flowing from my nostrils. At this juncture, the careful Brierly, who suspecting that we might fall asleep and allow the room to catch fire, by the fall of a brand from the grate or a candle from the table, fortunately made his appearance. Snatching me up, and followed by the bewildered youths, who as they could give no explanation of the occurrence, were wisely despatched to their respective beds, he carried me to my own room, and called up Mr Emanuel to attend me. My tutor, learned himself, in medical science, ascertaining at once that my system must have sustained some inexplicable shock, treated me accordingly, and as a state of collapse supervened, immediately applied such stimulants as were necessary, until a physician could arrive to take his place. My life was safe from the moment ay physical faculties were regenerated, but for forty-eight hours I was weak to childishness, and wandered in my conversation. It does not appear, however, that they gathered from my incoherent remarks, any clue to our adventure or its catastrophe; and as Brierly and the boys were silent from sufficient motives, concerning our Saturday night's freak, I was enabled to keep my own secret, until the appointed time for the development of the mystery had arrived. I said kept my secret, but this assertion I must now qualify – I kept for a time; but ten days of prostration on a sick bed made me, in my very helplessness, glad of a confident, and I chose, as might naturally be expected, my nurse. THE LEGEND OF THE RAVEN’S OAK. Sir Nigel Wagstaffe was possessor of Penroysteth Castle, in the day of Queen Elizabeth, at whose court he became one of the followers of the Raleigh faction, as opposed to that of the minion, Leicester, and accompanied his noble-minded carer in the expedition he set on foot for the settlement of Virginia and Guiana in North and South America. In early life Sir Nigel became enamoured of the daughter of one of his dependents, by name Anne Courthope, and with whom, under the intriguing connivance of her mother, it was supposed he had formed a connection, ratified by their secret marriage; when Sir Nigel accompanied Sir Walter upon his voyage to Virginia, she also made one of the passengers by the same vessel, but never returned, having, it was averred, followed her own inclination in publicly and openly marrying an adventurous planter, who was amongst the earliest settlers at the foundation of that colony. Sir Nigel, soon after his return, set at rest all conjecture and gossip upon the subject, by allying himself in marriage to Margaret, the daughter of Sir Robert Warden, of Warwickshire, at the same time that Raleigh married (although in secrecy) the cousin of this lady (Mary Throckmorton), for fear of the ridiculous jealousy and selfishly exacting admiration of the imperial and imperious Elizabeth. During the course of these events, Mabel, the mother of Anne Courthope (herself of Gipsy or Bohemian descent) continued to live upon the estate, where her influence over the tenantry was remarkable, and arose equally from her superior deportment, which might have given her ascendancy under any circumstances, and on account of her threatening and vindictive character, rendered more terrible by the power which she paraded, not only foretelling the destiny of others, but of bringing about her own maledictions. Subsequently, Sir Nigel having taken a share in the glorious repulsion of the Armada, accompanied Sir Cloudesly Shovel in his brilliant descent upon the Spanish coast. Returning thence in safety, he brought with him a beautiful lady, a native of that country, who had been rescued by him from a convent, and who, rather than return to her captivity, resolved to place herself under the loathsome protection of her deliverer. The unfortunate but now happy Isabel was received with open arms by Lady Margaret, whose heart yearned over this victim of religious tyranny and forced affections. It soon became plain, however, to all, save her who was the most injured party, that Sir Nigel and Donna Isabel were indulging in hopes of a closer union than, at present, law and society would permit; this event indeed, which they seemed at last to take no care in concealing, was approaching rapidly, for, from the day in which Sir Nigel had returned from Spain his wife had sickened and waned in a manner that showed her death would not long divide him from the object of his unholy passion. To effect her decease was now the study of the Spanish lady, her conspirator in this diabolical act being Mabel, whose drugs and charms were used at once to gratify her own her own malignity against her daughter’s superceder, and remove her vile employer’s obstacle to the coveted sovereignty of Penroysteth. Becoming impatient at the lingering character of Lady Margaret’s fatal illness she passionately urged upon Mabel no longer to delay the termination of their plot, and received, in return, an assurance that if she would meet the hag in the dead of the succeeding night at the foot of the great Penroysteth Oak, the lord and pride of its broad green woods, a final charm should be worked that would determine within twenty-four hours the fate of their long ravelled web of wickedness. The hour arrived, and the Dona kept her appointment with Mabel at the oak; she was cowering over a fire in a tripod, that throwing around a fitful glare, displayed a coffin covered with velvet and surmounted with the Penroysteth crest (a ducal coronet with a plume of crimson feathers issuing proper) by the side of which she crouched. Having performed some of her Bohemian incantations, she took off the coffin lid, and discovered within, a human form clad in the habiliments of the grave, and presenting the features, fixed in death, of Sir Nigel’s wife. Isabel at first trembled, so wonderfully exact were the figure and face, in likeness to those of her meditated victim, and she was not yet prepared to commit murder, in a manner so violent and repulsive to the feelings of a woman, but being urged by Mabel and assured by the recollection that not ten minutes had elapsed, since she had stood by and spoken to the dying Lady Margaret, she raised her hand and drove the weapon with which it was armed, in the body of the figure that was reposing beneath her arm. A frightful shriek awoke the echoes of the solemn wood, as the striker in dismay heard a groan burst from the cerements, saw its lineaments visibly stir beneath the shroud, and a burst of warm gore follow the weapon, as it was wrenched again from the wound, by the demoniac Mabel. Suffice it now to say, that there were found the coffin, and hanging half out of it, with the cerements disturbed as if by some convulsive struggle, the body, cold and dead, of Sir Nigel; near it was crouched the form, living but possessed, of Dona Isabel, a jabbering, frightful, hopeless maniac. On the night of that murder, Lady Margaret had died, her breath passing from her, at the very moment that the deceived paramour of her lord had ended his life, with the poisoned dagger prepared by Mabel. 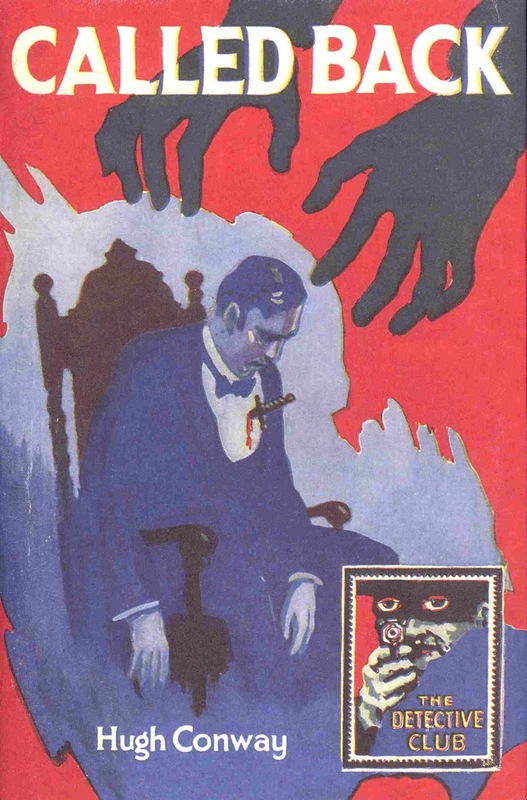 It will easily be conjectured, that to accomplish her great and dreadful revenge, the Bohemian had caused Sir Nigel to succumb to the power of some potent drugs, and placing his rigid form in the coffin, had directed the unconscious hand of the Spaniard, to its fearful and effectual aim, in the self same hour, that the subtle poisons concocted by herself, and administered by her agent, had ended the life of that other and joint object of her intense and undying hatred.